What’s the deal? Last week, great waves on many days, this week, nada. Unfortunately our third round of guests are here to surf, but have so far been out of luck. Not even good enough to try let alone rent a board. Today we went “wave hunting”, to Burros, Anclote, and Sayulita. And we’ve definitely seen better. There just weren’t any waves to be had for us today. It was actually the first time we’d found Burros, well actually tried to find it. In the process we got to do a little nature trek, a picturesque easy jungle trail that leads from the car area down to the beach, and with each rustle in the trees all I could think of was snakes slithering down around my head. We had a look, and decided it was busy, and rocky, with mediocre waves (at least today) and finished off with Josh’s favorite saying “well, we know its here” before heading back up to the car. From there, Anclote beach in Punta de Mita, which offered absolutely nothing on this fine day, but beautiful blue calm water and white sand beach. Even the restaurant was empty. Sayulita, our last ditch attempt, we found messy scattered sets of varying ride-able-ness. Josh rode a few in, I didn’t make it out past the first break, before deciding it wasn’t worth the paddling effort. I guess we were spoiled last week, we’ll have to wait now. We have learned that despite what www.wetsand.com says about wave height, we should actually be judging by the waves near the condo; if there aren’t any, don’t bother going down to Mita to try. In other news, we finally tried Rollie’s famous restaurant in Sayulita. 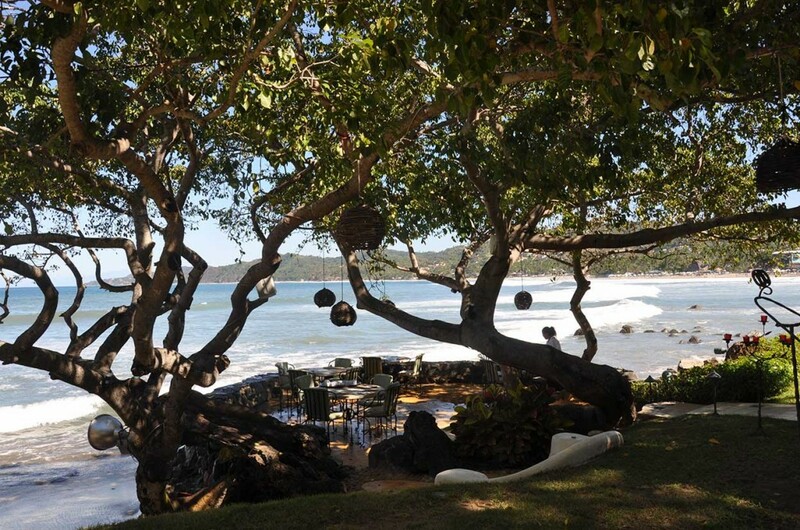 We’d heard lots about this place, and after a half dozen times to Sayulita it was time to test’er out. We had a tasty shake, a frappachino, and the french toast and homestyle fries. We even met Rollie himself; a retired school principle, who decided Sayulita was the pueblo (village) for him and his wife, after coming down for a vacation 11 years ago. He shook everyones’ hand at the table and took names before placing our drink orders. That’s how you get a great reputation. That, and having yummy food, served with a friendly smile. 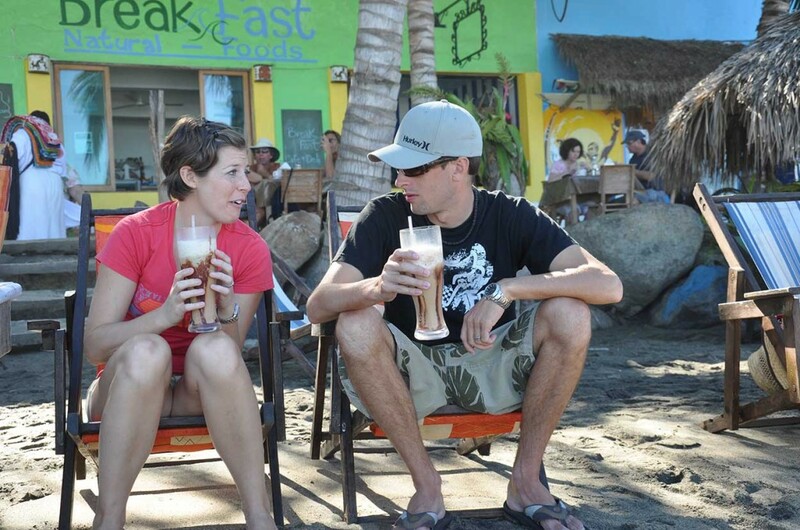 The people in Sayulita use his place as a reference when giving directions! It’s that popular. We were happy to learn that no leftovers go to waste either; Rollie told us that they donate them to a Mexican couple down the road to feed their animals. Sayulita has a strong sense of community where people help each other out. That’s a great example right there. How’s Nixon these days? Well, we’re not sure how his ears are doing. After two rounds of antibiotics, and some Otomax ear drops we hope the infection is gone. Both sides look less red, but he’s shaking his head a bit still. We pinned him up against the corner of the wall to give them a good cleaning, a difficult task, but one that needed to be done. I am hoping the shaking of the head is just due to some more wax buildup post-infection, so we’ll give it a couple days to dry out, and we’ll head to the vet to grab some epi-otic drops that are recommended for cleaning them regularly. 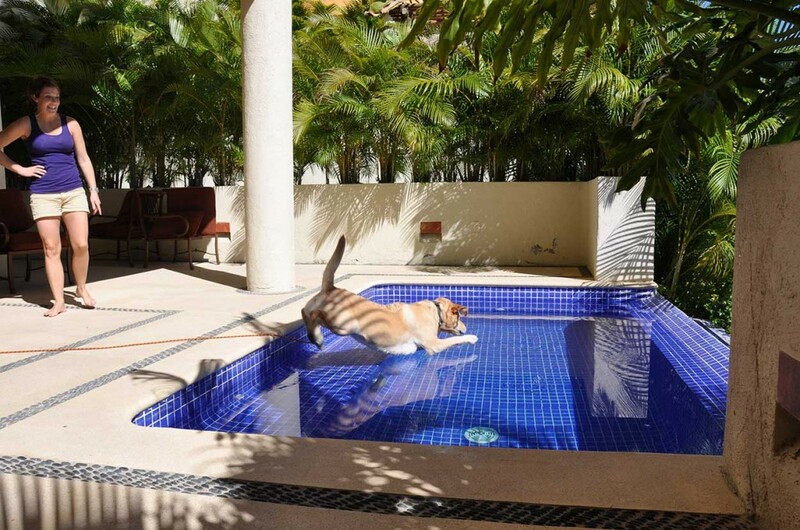 He hasn’t been swimming in 3 weeks and 3 days; I am counting, but I think he’s given up on it. He seems like a happy, tired dog after 2 walks and some ball in a day, so we’ll leave it at that until we can sort out a swimming headcover for those ears, and until we are more sure the infection is gone. He had his 5th birthday this week, and the bleached blong hair makes him look alot older until you see his Marley-like-antics. I am blaming the cheap dog food on his CRAZY shedding lately. There’s no other excuse, he’s barely got any hair its so short, it can’t be the heat anymore. However,this food must be chewed, so his teeth are better? Not a great trade off, but it will do until we head back home.